The reconstructed wooden covered bridge at Port Royal State Historic Area in Clarksville. The thirty-four-acre site of Port Royal in Montgomery County preserves one of Middle Tennessee’s earliest settlement areas. The first permanent settlers arrived in 1784, and the first meeting of the Tennessee County Court, North Carolina, was held nearby in 1788. The Red River Baptist Church, one of the earliest in the region, was organized at Port Royal in 1791. The town was organized in 1797, and during the nineteenth century it grew to a population of over twelve hundred. During the 1840s local investors planned to open a silk mill, but it never began production. In the second half of the century, R. L. Reding operated a broom factory and received a gold medal for his product at the 1904 World’s Fair in St. Louis. A renovated Masonic Lodge (1859) is the park’s headquarters and it has exhibits about Port Royal’s significant role in late eighteenth- and nineteenth-century river transportation. The park also contains the historic Sulphur Folk Bridge, built by the Converse Bridge Company in 1890. As one of only two Tennessee companies that specialized in metal truss designs, the company built a Platt truss design for the bridge. The original covered bridge at the park was constructed in 1903, but as workers removed its false support timbers, the bridge collapsed. It was rebuilt in 1904 and served the community until it deteriorated and fell into the river in 1972. 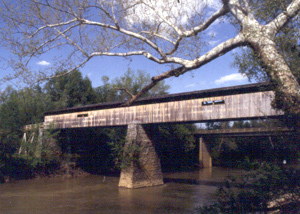 State officials built a reproduction of this covered bridge in 1978, but twenty years later heavy rains and tornado-strength winds demolished a large portion of the bridge on June 10, 1998. The remnants of the Port Royal Covered Bridge await restoration.